I have a Suburban Hot Water Heater. The T-Connector on the back is leaking. 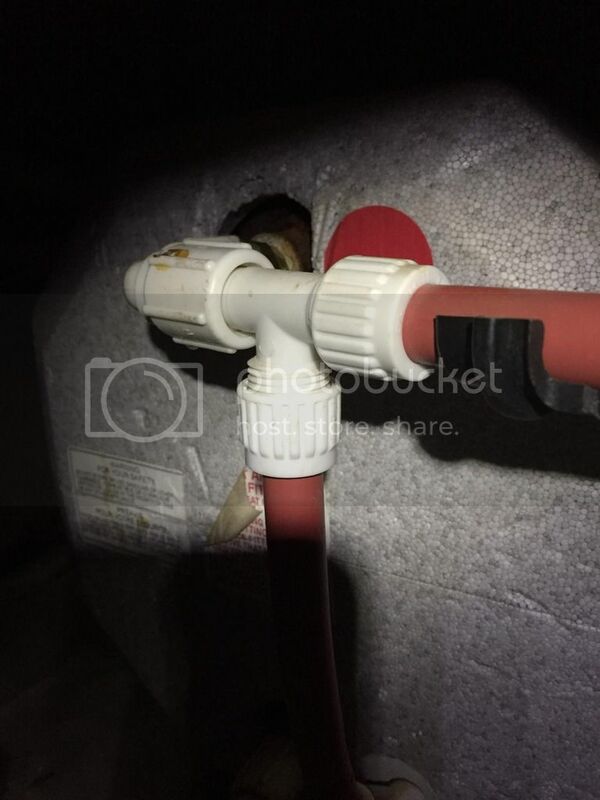 Now, I unscrewed it and put some pipe tape on there, but what I found out is that as you look at this picture, the end that connects to the elbow on the back of the hot water heater tank, the inside seal is falling out. I want to replace this T-connector, but for the life of me, I cannot find it online. I don't even know if I am searching the right thing. As you can tell, it's threaded on the left, the bottom, but on the side that connects to the elbow, the actual connector is fixed to the Tee. Help! Ditto or one of the big box hardware stores. I doubt those plastic fittings seal on the thread so teflon tape is probably not effective. That is a FLAIR it Connector for PEX any decent RV store should have (The better ones) I know General RV does. NOTE the T fitting I linked to may be the wrong one. She slipped the NUT over the pex. THen shoved it onto the T and tightened it down. Job done. No leak. That fitting is there in first link given to you. Connect a 1/2" male threaded pipe to 1/2" PEX or Polybutylene tubing, with another 1/2" tube teed perpendicularly with the Flair-It half-swivel-half-half tee compression fitting. CompleteMH delivers the half swivel by half by half inch tee from our warehouse directly to your door. For shipping rates to your location, add the mobile home half swivel by half by half inch tee to your Cart, enter your zip code, and click Recalculate. Choose Ground or Expedited delivery depending on your needs, and we'll get your order shipped right away! 1/2 inch saniprene seal 10 pk $4.25. I keep a couple spares in my plumbing spare parts box. Came in handy when I had to keep disconnecting and reconnecting a flair-it swivel connection when I had a plumbing problem. I wound up damaging the seal. Thanks for all the help guys. Got a new one on the way!